A long time ago, Sega released a first-person RPG for the Genesis, called Shining in the Darkness. Based on the testimonies I heard, it seems many people liked it. I never played it, and I don't really know why. 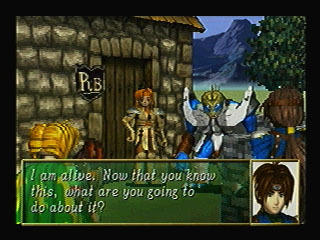 Then they changed the franchise slightly by turning it into a Strategy/RPG series, the Shining Force games. Finally, after all these years, they returned to the series' roots by releasing Shining the Holy Ark for the Saturn. 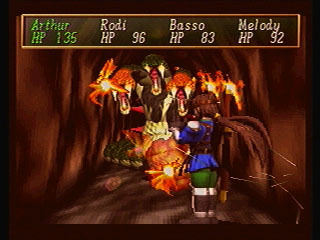 The game seems to be an updated version of the previous game, using the increased processing power of the Saturn for added features. The plot is a very interesting one, although it's very confusing. It's about good spirits and evil spirits who possess people. At the very beginning of the game, where the leading characters were involved in an accident inside a cave, I didn't know what the hell was going on. That's an unusual way to get the players into playing the game; so they make sense of what's happening. Later, you realize that the creator of that world allowed part of his spirit to possess some people. It was then up to them to use these powers for good or evil. Furthermore, some of these people used this power for evil and became known as "Vandals." They are now trying to access an ark to unseal the evil sealed within it. Your task throughout the game is to prevent them from doing so. That's quite a responsibility given to humans by this god, and it's very scary if you think about it. Also, from the very beginning, you realize that exploring all the mazes becomes the essence of the game. And since there is a self-generating map as you travel them, the exploration is always fun and exciting, as opposed to feeling like "work," which is what happens to me when I have to create my own maps. The hidden objects add to the fun, since you never know when or where you will find them. The graphics seem to be adequate for the Saturn. The characters seem to be pre-rendered 3D objects which have been converted into sprites for the game itself (hence the pixelization). Curiously, this change from 2D to 3D didn't hurt the game. They seem to have the same "look" they had on the previous Shining games. The towns and mazes, however, are in 3D and you can travel wherever you want within them. I was put off at first by the control within the 3D world. Instead of using a Quake-like engine, when you press the controller your character moves a specific increment. Eventually, I learned to use this on my favor and started "tapping" the controller in order to just move or rotate one "square's" worth. The rest of the interface will seem familiar to Shining fans like myself. The menus, the icons, the fact that your characters can change classes when they reach a certain level, and even the items you find as you explore, will bring back good memories of previous Shining games. I'm glad they did this. The game has some puzzles that will challenge you and frustrate you, even if only for a little while. On one of the mazes, for example, you actually walk though all the passages twice (once upside down). This is necessary because some items that you need in order to finish can only be accessed from the ceiling. At the end you are faced with an amusing puzzle that involves knowing the value of several precious stones so you can offer them to two statues. That got me "stumped" for several hours. 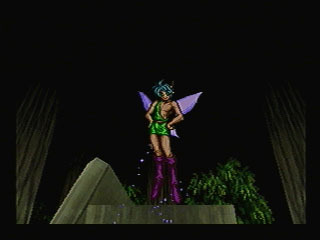 One of the coolest features of the game is that, as you travel, you can find fairies. As these fairies join your party, you can use them to attack your enemies when they first appear. I found myself searching everywhere, not for the other hidden objects, but for the fairies. Then I found myself listening for pauses when I moved around and for the sound of the Saturn's CD being accessed. All these are sings that an enemy is about to appear, and the only chance to choose the correct fairy to attack. It depends on whether the enemy appears from on front of you, behind you, to your left, to your right, and so on. You choose the proper fairy on these few precious seconds with the "shift" buttons. There are really very few towns on the game (four, actually). That's alright because, since your party has several characters (up to 8), you can see the plot unfold as events take place and they talk to each other, regardless of where they are. 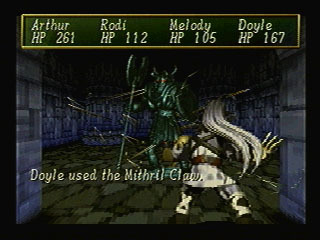 It' funny that, since the game is a first person game, you rarely ever see the members of your party. You only see them when they attack and when an important event happens. Then they miraculously move into your field of view. You never see Arthur, the main character, though. The game takes place through his eyes. The music is alright; good, but not great. Some of the tracks, however, like the one on the opening screen (before you press the start button), are very beautiful. At times I did not press the start button on purpose so I could listen to that theme. For my final words I want to say, again, that the most fun and memorable part of the game is the exploration of all its mazes. The very unusual plot also adds to the appeal of Shining the Holy Ark.